Is it possible to import a text file which contain plot coordinates and have the plot coordinates plotted automatically by LibreCad? I think the Read ascii points plugin is what you are looking for. Thanks. I looked at that awhile back, and wondered if there wasn't a more direct and simpler way. Have you used this method? No, I had not, never had a use case for this plugin. Most information for Load Command File and Paste Multiple Commands are linked in my reply there. 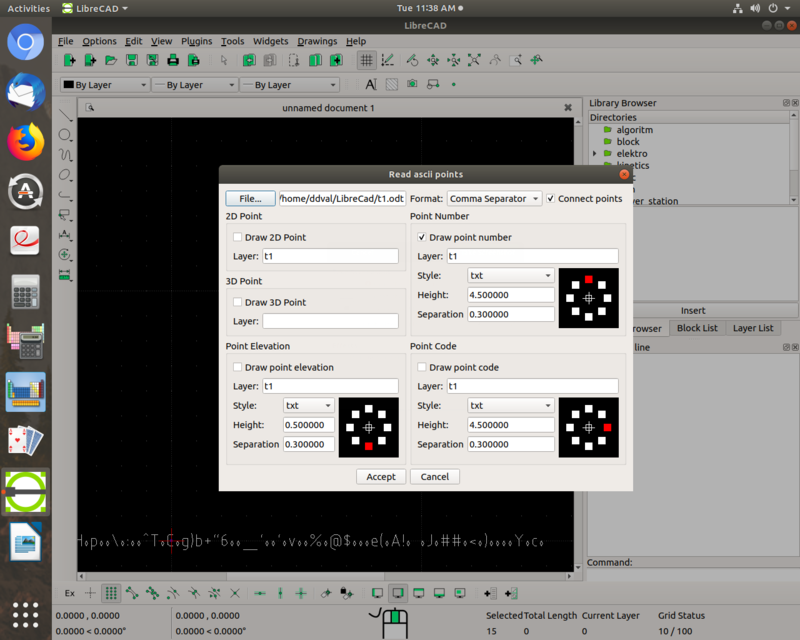 With regard to subject plugin: LibreCAD manual, accessed via LibreCAD "Help" menu, shows an interesting example, at very end, on how to plot text file coordinates. Here is a screen shot of the plugin as noted in the example. I've followed the example's instruction, and the result prints a single line of garble at the bottom of LibreCAD work area. I copied an pasted text list noted in the example and saved it as a text file (.odt). Created a layer and named it (t1). NOW! I go to File - Import ( Verision 2.1.2) gives two options to import, Image or Block. Any ideas! Thanks Armin. To unsubscribe from Text file, click here. After further research I've discovered my inquires on this matter is covered, seemingly, in depth. Thank you Arimin, and please disregard my latest email on subject matter.